We’re talking to JenniferAdams,who is Gizmo’s handler, but we like to think of her as his “People Mom.” We asked her to tell us the story about Gizmo the Wonder Doglet, the tiny little dog with a huge, healing heart. She walks us through their journey together. Where did Gizmo come from? How did the two of you meet? After my 19 year old therapy dog dachshund (Mr. Moxie) passed away, I searched several shelters to adopt another dog to follow in his footsteps. However, I was repeatedly turned away for various reasons such as not having a fenced yard, etc. Meanwhile, I was researching small breeds that make good therapy dogs, and Gizmo’s breed kept popping up. I had never heard of his breed before. Then a short time later I was in a doctor’s office, and the classifieds were open to the pet section on the table next to me. I saw a picture of an adorable little black and white puppy and took a closer look. It was the breed that I kept coming across in my research, of all things! So I called the number, did more research and discovered this was a reputable breeder, and picked him up the next day. As soon as I saw him, I said, “There’s my dog!” The rest is history. Did you have an interest in providing therapy to people through an animal previously, or was this an idea that occurred because of your new acquaintance with Gizmo? Before Gizmo I had a miniature dachshund named Mr. Moxie, who went to schools with me all over the country. The difference Mr. Moxie made in so many young lives is remarkable. Kids who never wrote before suddenly started writing letters, and even books, about Moxie. Owies were healed, tears were dried, anger dissipated and love prevailed, all because of him. Before he passed away at the ripe old age of 19, I promised him I would find another canine angel to continue his legacy. What about him led you to believe that he should be a therapy dog and how did you and he get started? I think the deciding moment came when we were walking in the woods one day. Gizzy was less than a year old. There was a teenage boy sitting off the trail a ways, leaning against a tree by himself. Gizmo confidently walked over to him and sat at his side until the boy started petting him. Then Gizzy climbed on his lap. I called Gizmo back, but he simply would not budge. So I stayed in the area to keep an eye on him as I continued walking my other dog, Cooper. That’s when we met a woman on the trail. She identified herself as the boy’s mother and explained to us that the boy had just lost his father, and was inconsolable. It was clear that Gizmo knew just how to console him. Since then, Gizmo has shown his gift for sensing emotional need and seeking people out who need him. It’s really quite stunning to watch him sometimes! How does he help people in his therapy work? What does he do for them? Gizmo, like all therapy dogs, has a soothing effect on those around him. People seem to be drawn to his friendly, nonjudgmental, loving nature. He has been shown to lower blood pressure while turning frowns upside down! Many times he has motivated residents in a senior living environment to eat, get out of bed, converse, and laugh. He has motivated school-aged children to read, write, and commit random acts of kindness. He is an outlet for many of them to vent when they’re angry or cry to when they’re sad. I will never forget the day a sulking boy stomped into my office and exclaimed, “I have GOT to get this off my mind! Can I PLEASE speak with Gizmo in private?” I stepped right outside the door and watched him as he held Gizmo close and whispered into his ear for several minutes. Then he gently placed Gizzy back onto his blanket, stepped out the door, smiled at me, turned and said, “Thanks, Giz. I’m going to have a good day now, I hope you have a good day too!” and went on his merry way to class. Gizmo’s Frens page on facebook has over 11,000 people, which is remarkable. How long have the two been doing this work? What kind of places do the two of you go to and what do you do there? That’s a loaded question! We go to all kinds of places, for all sorts of reasons. Sometimes we go to places where Gizmo is needed as a therapy dog, like The Village at Buckland Court assisted living community in South Windsor, where he has been visiting on a regular basis since he was a puppy. Sometimes we are at Gizmo’s “excellent high school”, where he works as a therapy dog and is a mascot for their website. Sometimes we just go out and attend events in the community to draw people to the event and to support great causes and other peoples’ efforts to make the world a better place. Sometimes we just show up where we catch people being kind…like an Eagle Scout candidate working on his project or a group of kids helping an elderly woman by cleaning up her yard. And sometimes we are fundraising for our nonprofit, through which we assist many other charities by donating 100% of our proceeds to others. Wherever we go, it always seems we are somehow just where we are meant to be. Talk about his nonprofit situation. When did that come about and what is the purpose of it? 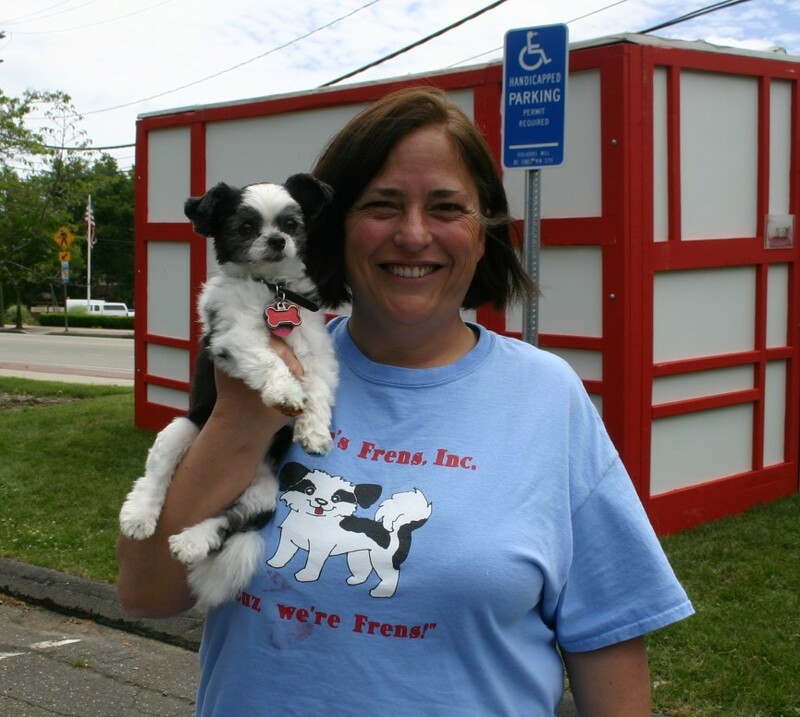 The mission of Gizmo’s Frens, Inc. is to raise awareness and funds for charities. Gizmo has always attracted a lot of attention. I wanted to do something good with his rising popularity, to paw it forward for all those angels who spend their lives helping so many. I approached some pet store managers and asked if we could fundraise for rescues. I was told over and over that in order to fundraise, we needed to be a nonprofit. So I finally decided if we need to be a nonprofit in order to make a difference in this capacity, then a nonprofit we shall be! Today we are blessed to be able to raise awareness and funds on a regular basis for a number of charitable causes at Pet Supplies Plus and Wicked Chic, both in Manchester. We are at Wicked Chic, located at 687 Main Street, every Thursday from 6 to 8. Visitors are welcome to come out and meet Gizmo and browse the beautiful, unique items available inside the store. We are still in the process of having 501(c)3 status, so we are well on our way to being able to affect change for many, many more pet rescues and other charitable organizations such as food pantries and organizations that help at risk youth. What are Gizmo’s future plans? What’s up and coming? Gizmo has always just gone where the road leads him. We have no specific plans at this time, other than to trust that the people who cross our paths are there for a reason, and we will be just where we are meant to be. A production company (Hudson Street Productions) has been filming at some of his events, and a made for public television documentary (with plans for a future series) is being created as we speak. They plan on filming over the course of a whole year, so look for the release in the next year or 2! Geri Jones wrote a poem about Gizmo and included it in her new book. How did she and Gizmo meet? Geri Jones is a perfect example of how people come into our lives when and where they are meant to. We both drive MINI Coopers, and as such, we are on some MINI forums. While we never knew each other on the forums, some other people (from all over the country) mentioned to both of us that we should meet. Then I found out she lives within driving distance, so on July 4 of I don’t remember the year, we met Geri, to help her celebrate her first 4th of July as a US citizen. I knew right away what a super special soul she is because Gizmo was unusually enthusiastic about her presence! To this day, he still dances and marfs whenever she visits. Where can we buy Gizmo Frens t-shirts? Gizmo shirts are not for sale. Rather, they are given in exchange for a donation to Gizmo’s Frens, Inc. 100% of the donation is in turn donated to other charities. We have even given shirts to people who have donated directly to their favorite charities! For us, it’s not about the money. It’s about assisting those who assist others. For more information, contact us on Gizmo’s FB page at www.facebook.com/gizmosfrens. He’s such an adorable little “doglet.” Will people be able to buy stuffed toy Gizmos for themselves at some point? Is there anything else that Gizmo would like to say to our readers? Gizmo has 4 toy-sized “frens” (Nina, Lacey, Lilly and Cooper) who visit the assisted living community and make community appearance with him as needed. If anyone would like a visit from Gizmo or his PFF frens, they are welcome to contact us on our FB page (www.facebook.com/gizmosfrens) or email gizmosfrensinc@yahoo.com. We are willing to provide animal assisted therapy, or we can come out to an event to support a charitable cause, which we will promote on Gizmo’s Facebook page. All of our visits/appearances are free of charge. Cuz we’re frens!